While it’s officially winter already, I’m having a difficult time associating these coolish, dry Brisbane days with what I know and remember winter to be. Back in Auckland, winter was about hunkering down, staying warm and fighting the damp that would inevitably seep its way into carpets and wardrobes over the course of long, rainy months. Fortunately, Colin and I both share a love of rainy weekends – the harder the rain and the colder the wind, the more inviting it is to snuggle up on the couch to watch movies or read books. It’s like falling asleep to the sound of rain on the roof; that privileged feeling of being cocooned and protected from the elements. On either a Friday or Saturday night, my winter ritual was to make a large dish of apple crumble to see us through weekend desserts, breakfasts, and the occasional spoon or two directly from the fridge. The crumble topping I make borrows heavily from my mother’s, and features rolled oats, brown sugar and cinnamon, in addition to a base of butter rubbed into a small amount of flour. Mum always added sunflower seeds to her crumble topping whereas I most often use roughly chopped almonds. In addition to the apple, I like to sometimes include persimmon (with lemon zest and coconut in the crumble topping), or a handful of frozen blueberries or blackberries. But there is always an apple base, stewed a little on the stove-top first before being adorned with crumble and baked in the oven until browned and caramelised. The signs of winter are all around me here in Brisbane, in the predominance of apples and pears at the market, the coats and gloves of people walking to work, and the colds and flu felling my colleagues. But it’s just not cold enough to take it seriously. Granted, we attended the Florence and the Machine concert at an outdoor venue a couple of weeks ago and found it to be a frigidly cold night, despite wooly scarves. But last weekend, we walked in the sun to the local organic shop, wearing nothing more than jandals, shorts, and T-shirts. Don’t get me wrong – I absolutely love this beautifully clear weather – but I also miss those cold, dark, wet, batten-down-the-hatches-and-stoke-the-fire weekends. How ungrateful am I? In my defense, as the apple crumble story above attests, this clearly has something to do with winter providing the justification and the means for the best kinds of comfort food. When it’s cold outside, there is nothing better (to me) than to potter and stir, bake and chop, to consume and feed others. Summer is for being outdoors and eating quick, simple meals of BBQ and salad. Winter is what sets my creative juices flowing, when the kitchen truly becomes home’s heart. Lets settle for ‘autumn’ shall we? Last weekend I made a very autumnal cake for friends who were coming for afternoon coffee. This Spiced Pear Cake is exactly the kind of cake that I love to make – rustic, not too sweet, and with a hearty, wholesome texture. There is only the barest suggestion of rising agent, and the resulting dense and heavily spiced crumb is the perfect match for the sliced pears, rendered slightly leathery by the oven’s heat. The recipe comes from one of my favourite food blogs, Nourish Me. Lucy takes photos that I can only dream of one day emulating, and many of her recipes have become part of my repertoire. Usually, I make this cake exactly as Lucy specifies, but this weekend I found it impossible to track down allspice. Fortunately, my substitution of 1/4 tsp ground cardamom worked rather well, and I might just continue to make it this way forever more. Butter and line a 25cm spring form pan. Preheat the oven to 160°C/320°F. Cream the butter and sugar together until pale and fluffy – at least two minutes. Add the eggs one at a time, beating well after each addition. Add the yoghurt and vanilla and stir through. The mixture can look as though it has split at this stage, but just continue. Gently fold in the dry ingredients until well mixed (I find a spatula is best for this job). 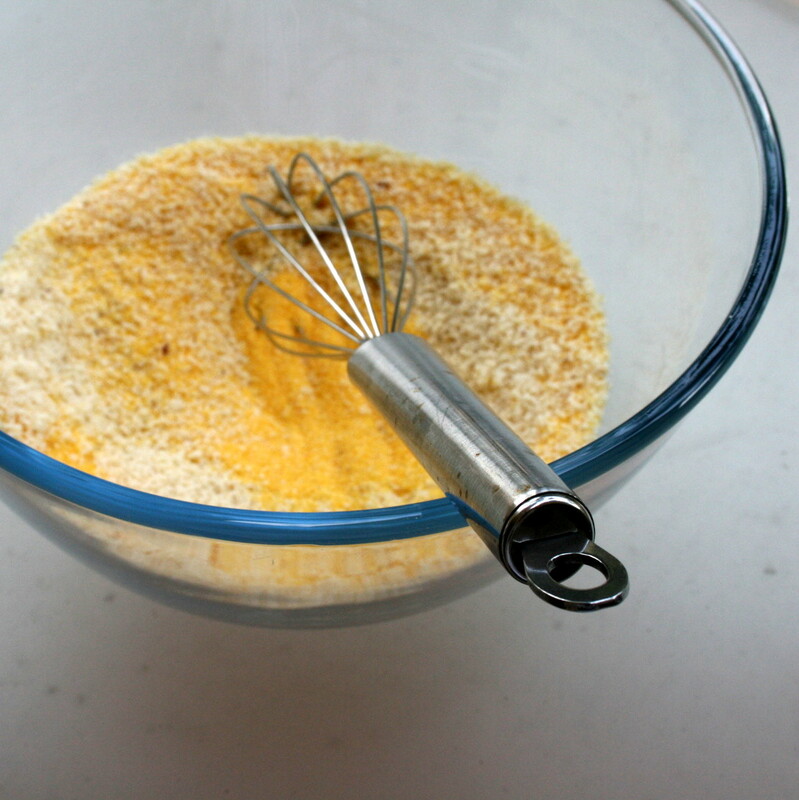 Scrape the mixture – which by now should be smelling so good that you want to bury your face in it – into the prepared cake tin, smoothing it out with the spatula. 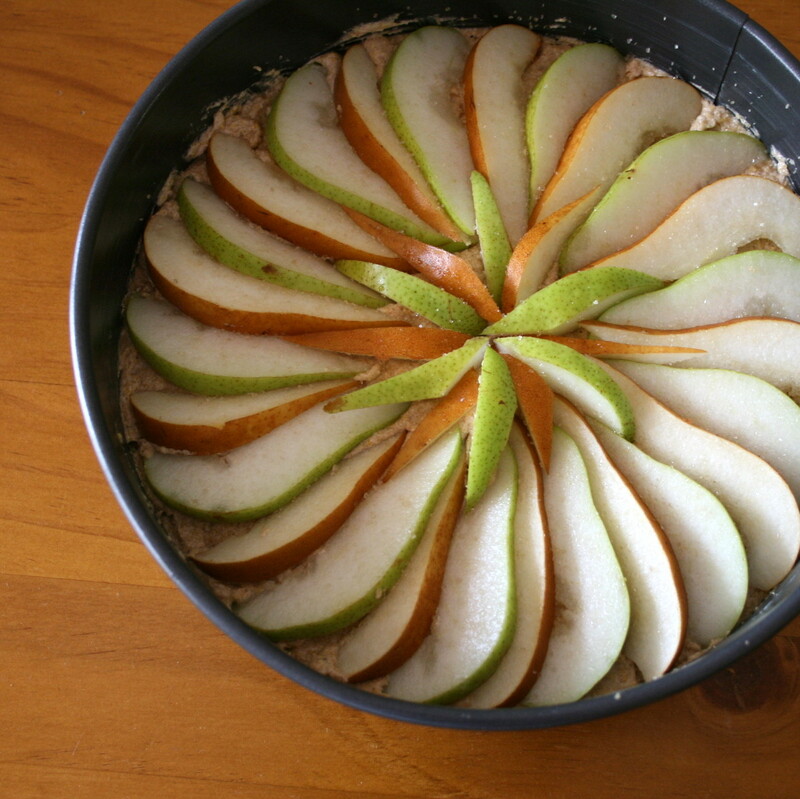 Arrange the pear slices on top. Sprinkle a little raw sugar over the pears and bake for 45-50 minutes, or until a skewer inserted into the cake comes away clean. Cool in the tin for a while before removing. Eat with yogurt and strong coffee, in a T-shirt, in the winter sun. 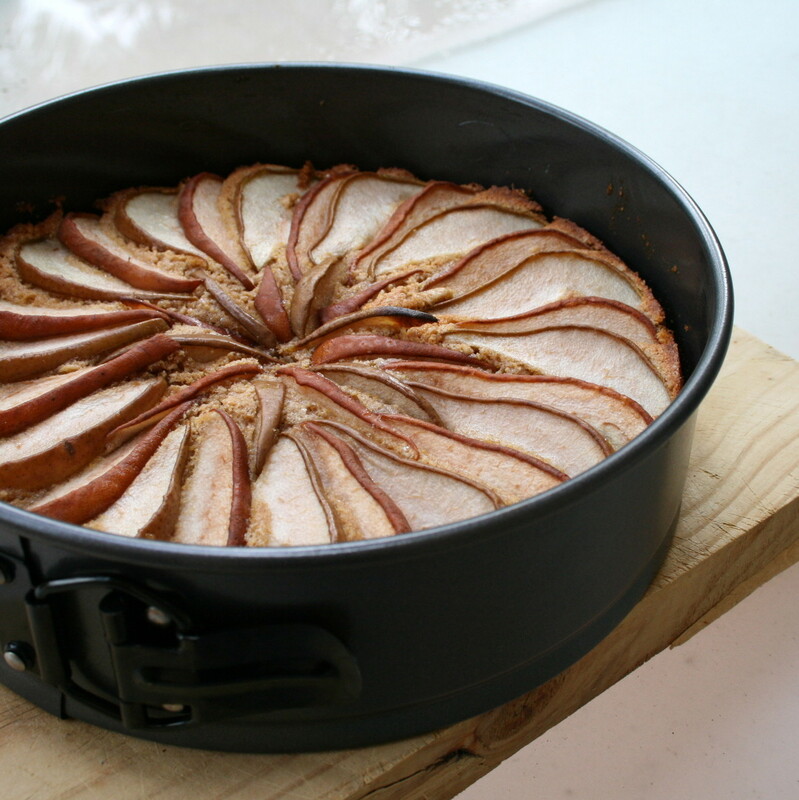 This looks great – I do love me a good autumn cake! Me too – there’s something so satisfying about cooking fragrant, spicy autumnal cakes, especially after the long hot Brisbane summer. The baking vibe really starts to kick in at this time. Good food post! I might even make this cake, when I get back to the Auckland winter from Italy. But you are beating yourself up too much about photos. I went to the Nourish Me site and looked; I reckon your food photos are at least as good if not better. Keep it up.